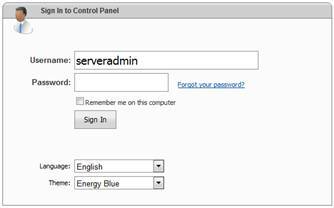 On sign in form you have an option to remember you next time you open control panel, so you dont need to login again. Of course, make sure you dont check this option on a public computer. Depending on what was configured by your hosting provider there may be additional visual schemes and languages installed. You could select theme or language from the appropriate dropdowns. OK, in order to sign in Im entering username and password to appropriate fields and click Sign In button. 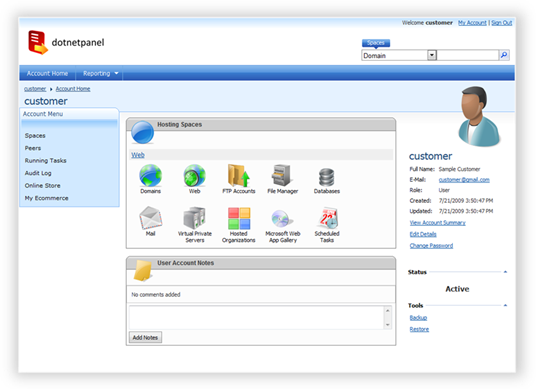 On the left pane there is a second part of user account menu with functions available to the current user account. You could see selected user account in the top breadcrumb. On the right pane you could see user details, account status and action links. On the central part of the page there are list of user account hosting spaces and account notes. Create SSL certificate for my site and install.